As with all the Introductory packages the price is fully inclusive of landing fees, instruction, third party insurance and club membership. Once you get the 'flying bug' you can progress to the full PPL (Private Pilot's Licence) course; complete an IMC course (flying on instruments); fly a twin engined aircraft; train as a Commercial Pilot (and join the airlines) or become a Flight Instructor! 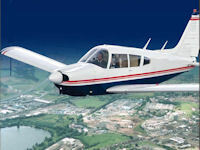 We can train you for all these courses: we have friendly, professional flight instructors to smooth your way through the various courses - hence our motto the 'Friendly Experts'! As long as you are reasonably fit there is no age limit. For the two seater aircraft there is a recommended maximum height of 6 ft and weight of 17 stone (although do please let us know if you are over 14 stone). If you are outside these limits we recommend that you pay a little more and fly in a four seater aircraft: it will certainly be more comfortable that way!